Junior nationals are the summer highlight for many livestock exhibitors. It doesn’t matter the species or breed, these week-long events allow young people and their families to travel to a destination to show their livestock, participate in educational contests, discover new sites and make lasting memories with lifelong friends. However, anytime you travel as a group and with livestock, there is bound to be a little stress involved. With proper planning, communication and perhaps the help of a checklist, you and your family can enjoy an exciting, memory-filled junior national event. By now, most entry deadlines are past, and hopefully you submitted those on time and properly. But there is still plenty to prepare for. Make sure you are aware of all the rules and know the schedule of events for the show and contests. Every breed and species has different rules, schedules and events, and so if this is your first time participating at a particular junior national, make sure you have all the information you need. With the advancement in technology, many youth associations use social media to update members on show announcements or reminders. Many associations use Facebook, Twitter, Snapchat, Instagram and text messages. Jaclyn Upperman, Director of Events and Education at the American Angus Association says they send out a confirmation package to each family with valuable information they need to know with a confirmation of entries. Ellen Knauth, Director of Junior Shows with the National Junior Swine Association, says in addition to social media they use email to keep their exhibitors updated. First time exhibitors might feel overwhelmed. Lindsey Broek, Director of Shows, Communications and Events with the American Maine-Anjou Association, offers two great pieces of advice for first-timers: ask questions and get to know your state advisors. State advisors are a great “local” or “on-the-ground” contact and oftentimes will know about activities planned within the state organization. Working with them is another way to meet new people. Upperman suggests limiting participation on your first year out so you can experience the event without getting in too deep. “Take just one head to participate and try to attend every event throughout the week to just ‘see’ it. Don’t get overwhelmed but EXPERIENCE it. Then the next years focus on what interests you; is it the “contests” or showing multiple head and winning classes. I would also encourage young people to meet people; don’t just sit at the show box. Some of my best friends came from the other side of the United States,” Upperman said. All three youth directors remind exhibitors to bring important paperwork – registration papers, health papers and copies of your entries. This will help your week get off to a good start. Don’t forget your phone charger, a camera, plenty of clothes, snacks and drinks, show essentials and any resources you might need for educational contests. It might be wise to make a checklist of items to pack for each day or event, and make sure they are in the trailer or vehicle before you leave. Junior nationals have three key focus areas: fun, competition and education. And part of the education comes with a rules and guidelines in place to help facilitate the show and the contests. Rules are a useful tool in everyday life; not something else for association staffs and junior boards to memorize. “Although all rules can prove challenging at one time or another, they are all in place with the exhibitor in mind. We try to make our shows as exhibitor friendly as possible. Any rules we make are thoroughly thought through by our staff and Youth Advisory Board, so chances are we have thought about every situation when making the rule,” Knauth said. You’ve read the rules. You know the schedule. You have packed everything you need for a memory-filled, stress-free week of junior nationals for you and your family. But don’t forget that the travel and change in environment and routine will likely bring stress to your livestock. You’ve worked hard to get your animal looking its best for the junior national, so you will want to keep it feeling and looking its best the week of the event. Be sure to pack plenty of Sure Champ® and Vita Charge® products with you to keep your animals feeling and looking their best. Hopefully, you’ve had your livestock on products like Sure Champ Spark, Sure Champ Extreme with Climate Control or Sure Champ Cattle most of the summer. But did you know there are products specifically formulated to help your animals combat the stress of the haul to and participation at a junior national or any show? Vita Charge Paste is formulated for all species of livestock and supports digestive health. It promotes feed and water intake during times of stress and recovery. We recommend starting the paste 3-5 days before leaving home and for the duration of the show and until you return home to keep your animals on feed and water. Vita Charge comes in other forms such as Liquid Boost that you can add to the animals’ drinking water or a Stress Tub that many cattle exhibitors take to shows to help keep their animals feeling good and looking good. Sure Champ Climate Control is another quick-relief paste you will want to take to your junior nationals with you. 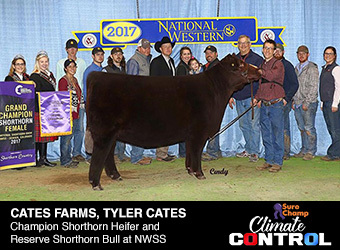 Climate Control helps all show livestock handle heat stress by lowering the animal’s body temperature in a safe, fast and natural way. This paste contains Capsaicin to help maintain circulation to help support animal performance in heat stress and contains garlic, a natural insect repellent. Both the Climate Control and Vita Charge Paste contain Amaferm®, research-proven to help maintain normal body temperature. Amaferm is a natural prebiotic designed to maximize the nutritional value of feed. It is research-proven to combat stress by supporting the animal’s own immune system, significantly increasing intake and nutrient absorption. You’ve got your trailer packed, including Sure Champ and Vita Charge. And you’re ready for a week of Junior Nationals. Broek reminds of one last thing to bring. 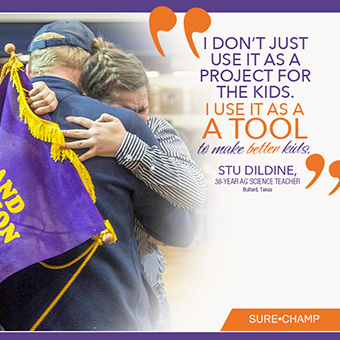 Make memories, pack your Sure Champ and have a fun junior national.